I spent last week entertaining my dad during his London visit, which was great because he likes to do most of my favorite activities: cook, eat, drink wine, take Gertie for walks, and travel. (We went to Porto for a few days, but more on that later.) Having my dad there to share kitchen duties was a bit of a vacation in itself. Plus, I credit him not only with where I developed my love of cooking but also my ability to cook. One of my favorite recipes I learned from him was lentil soup. My dad got the original recipe during grad school from a cookbook called Good Cheap Food; perfect for the “starving student.” Apparently he used to call it mud soup. Over the years we have made our own takes on the basic lentil soup – for me, adding a splash of red wine (maybe not on a poor student’s budget) and mushroom stock. My dad sometimes he adds curry powder, which I will try out this winter for sure. Another thing I’ve inherited from my dad is his appreciation and enjoyment of wine. My dad and his wife, Carol, live in Winston Salem, NC, right on the edge of the Yadkin Valley, which is a growing wine region, benefiting from the cool Blue Ridge air. My dad likes to joke that he has wineries in his backyard, but he actually does take his Sunday crossword out to wineries and enjoys the sweeping views with a glass of wine. So for the first night of my dad’s visit I went back to my perfect wine and dinner pairing challenge and made red wine braised kale with grilled chicken thighs, which I served with Decero, my all-time favorite Malbec. If you come across a bottle, BUY IT! THEN DRINK IT! My dad’s visit was a bit of a trip down abroadcooking memory lane. I suppose, like an eager kid, I wanted to show off some of my recipes. I also cooked up my Goat Cheese & Chorizo Dip to go with taco night for NFL Sunday and a last minute dinner of Coq au Vin Soup (served with my dad’s basic french bread – I now realize I still have room for improvement; his is so much better!) When I was little, my favorite job in my dad’s kitchen was to punch the dough down after it had risen. My little fists usually needed about 4 punches. But hey, it got me started early on this brilliant baking. I reference my basic bread dough all the time, but the more you make it the more ingrained and easy it becomes. 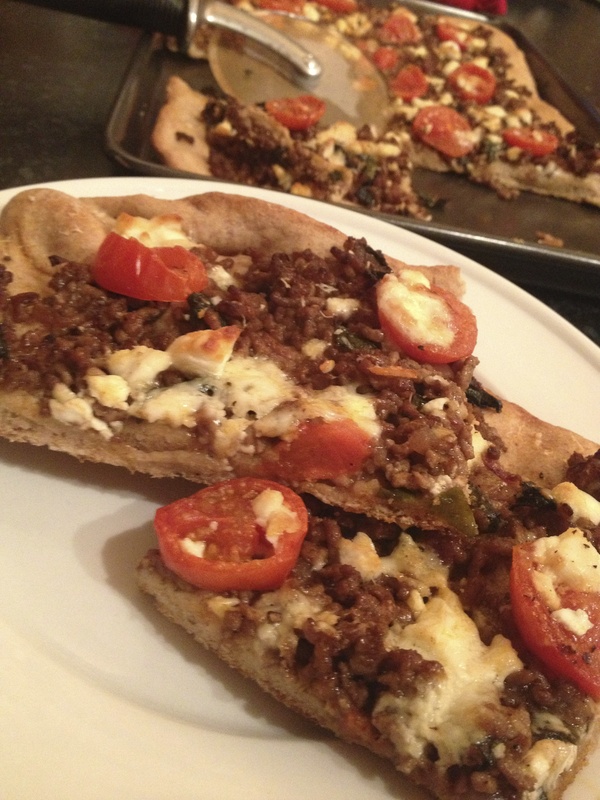 So kneed up a batch and make this awesome lamb flatbread. Note that for this recipe I like to use about 1/3 wholewheat flour to add a bit of a nuttier hearty flavor base. I first made this pizza in late spring, which is ramps season – the perfect mellow fresh garlic flavor – but you can certainly make this year round. 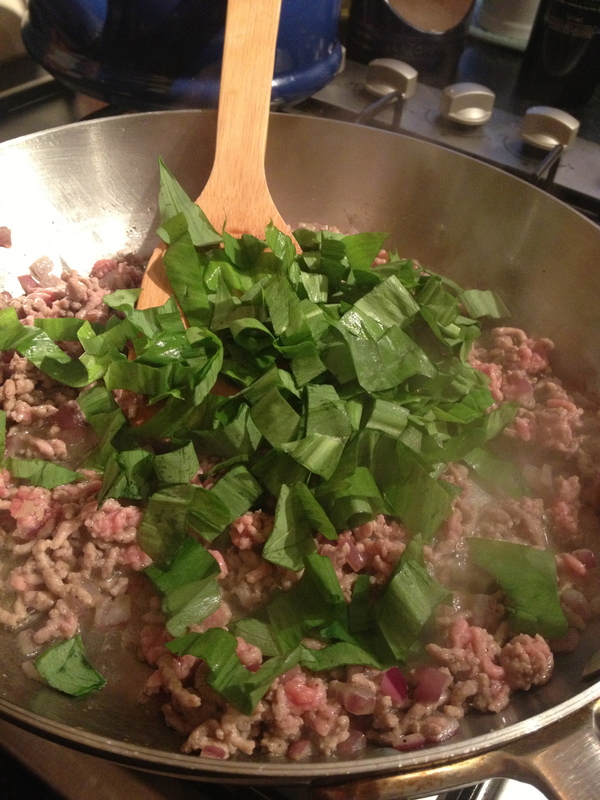 Just substitute a few cloves of minced garlic, cooked in with the onions, and add some chopped leafy greens (spinach or kale) for a bit of brightness. Once everything is cooked together, add a splash of balsamic vinegar to deglaze the pan and get up any yummy, lamby brown bits. Once the balsamic reduces a bit it will add a sweet, zippy bite to the topping. Spread the lamb topping out evenly over your bread dough. 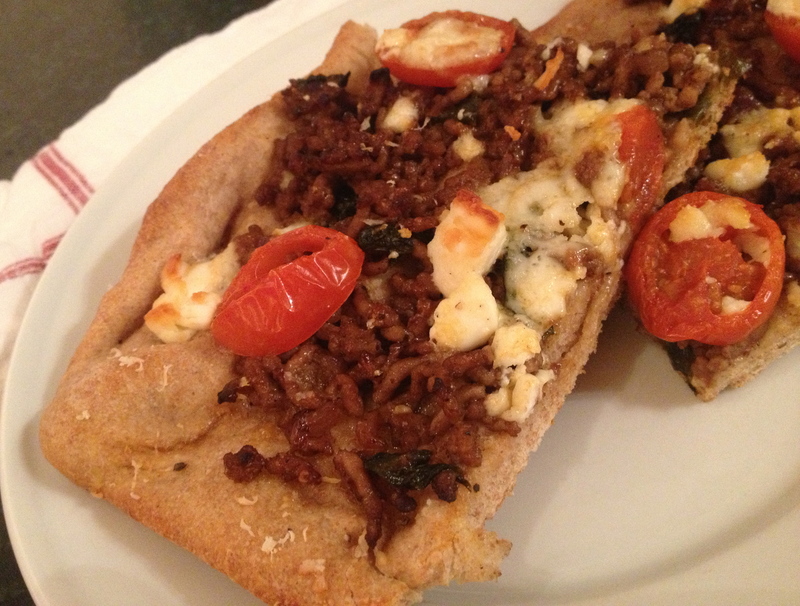 Then top with fresh slices of tomato, some salty crumbled feta cheese, and a happy, heavy coating of grated parmesan. After about 12 minutes in the oven…voila!!! If you served this up with a butternut squash salad, this would be glamorous enough to entertain with. *Use the recipe for my basic bread dough, substituting a combination of 1 1/2 cups wholewheat flour and 2 cups all-purpose. Add red onion and olive oil to a skillet and sauté over medium heat for 5 minutes, until soft. 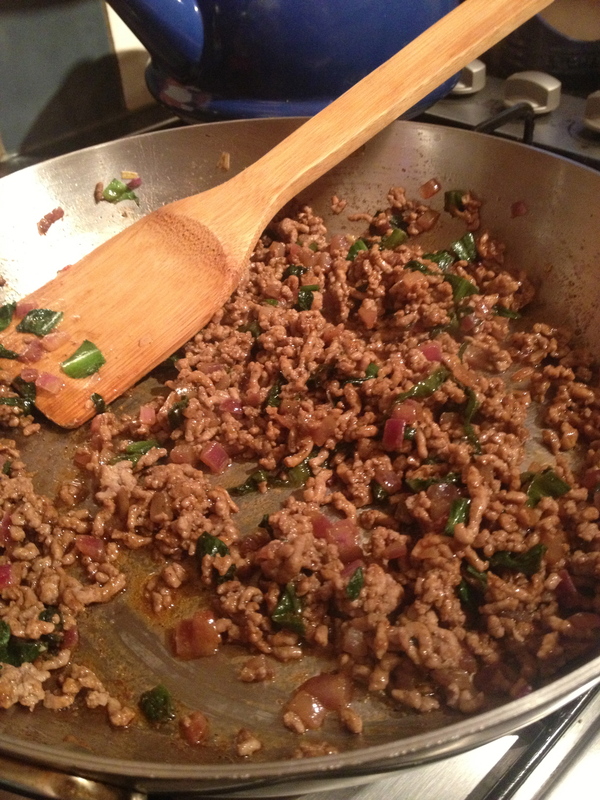 Add the ground lamb, crumbling as it cooks for 3-5 minutes, until browned. Season with Greek seasoning. Stir in the wild garlic (or spinach and garlic) and wilt slightly. Then deglaze the pan with balsamic vinegar and reduce for 1 minute. Turn off heat and set aside. 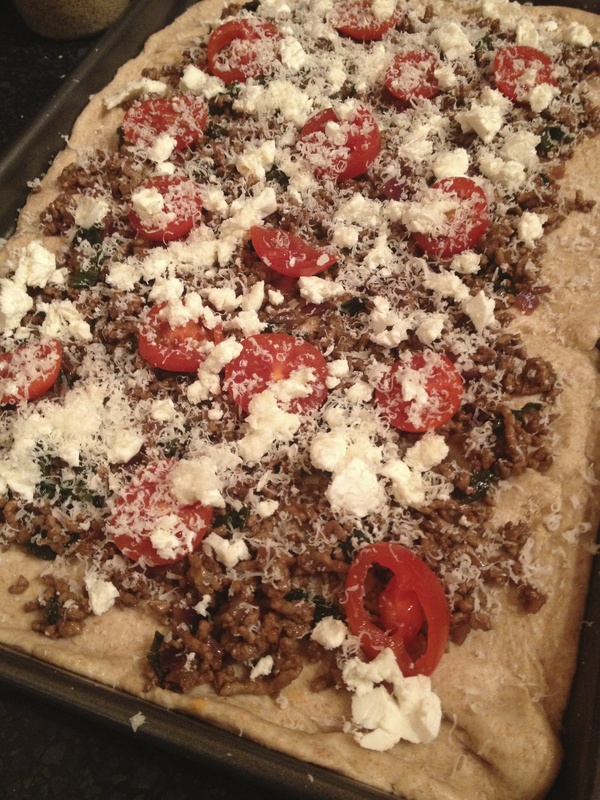 Roll the pizza dough out onto a baking sheet to an even round, ½ inch thick. 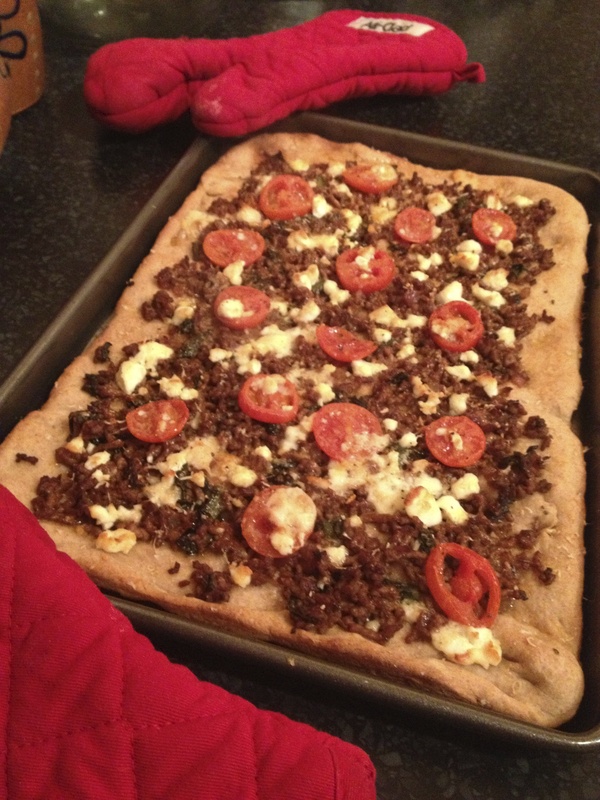 Top with the lamb mixture, sliced tomatoes, feta, and Parmesan. Bake for 10 minutes until golden.